No, I’m not just jumping on the hype train for Super Mario 3D thanks to the word that it should hopefully be out this year – I’ve been excited for the new game ever since it was announced and we heard that it was going to be developed by EAD Tokyo, the team behind the Super Mario Galaxy games (two of my personal favorite games ever, I might add). Yes, I am saying that I’m more stoked for this than I am for Ocarina of Time 3D – traitorous, I know. But seriously, if I had to limit myself to purchasing one 3DS game for this entire year, I would definitely choose Super Mario 3D. Today’s news – if you can even call it that since most of it is stuff we’d already seen or guessed anyway – certainly heightens the excitement, though. 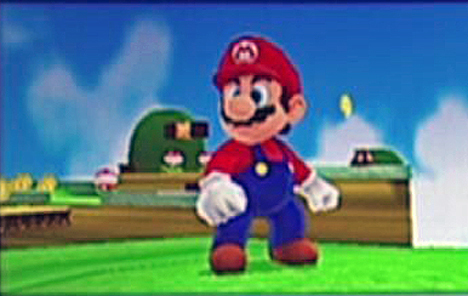 I have an idea about what Miyamoto might mean by his statement that Super Mario 3DS will be a fusion of the 64 and Galaxy games, as well as what the return of the raccoon tail might mean for 3D Mario. Miyamoto told Edge Magazine that Super Mario 3D will be “a combination of Super Mario Galaxy and Super Mario on N64” – an interesting proposition, but what does it mean? I think the answer’s probably pretty simple: since it’s being made by EAD Tokyo, obviously we’re going to get a lot of similar gameplay to that of the Galaxy games, but as we’ve seen from the early screenshots, we’re also getting a more Mushroom Kingdom-like world. The return to the Mushroom Kingdom could itself be what Miyamoto’s talking about, but I think it goes a little deeper than just the aesthetics. A lot of people, fans and critics alike, really missed the idea of an intricate hub world in Galaxy. 64 had Peach’s Castle, Sunshine had Delfino Plaza, but the Galaxy games just had a space ship from which you accessed levels from a world select screen rather than actually tracking down their entrances in the overworld. I get the impression from the effort to pull this game somewhat back in the direction of Super Mario 64 that a more expansive hub world might play a role in the upcoming game. Personally I’m pretty indifferent about hub worlds in the sense that I don’t feel they help or harm the core game in a particularly impactful way. At the same time, though, I realize that hub worlds offer a sense of cohesion and exploration that just wasn’t possible in the “galaxies” structure. If Tokyo EAD can create a compelling hub – and I see no reason to believe that they can’t – then more power to them. I think that returning to the Mushroom Kingdom (assuming that is indeed what we’re seeing in the screenshots) actually is pretty conducive to this prospect – we haven’t seen the realm really fleshed out in a core 3D Mario title, even considering Super Mario 64! When you think about it this way, such a move is about 15 years overdue. It’s been awhile since we truly soared in a Mario game. (I’m not really counting the Red Star in Galaxy since its use was so heinously limited.) 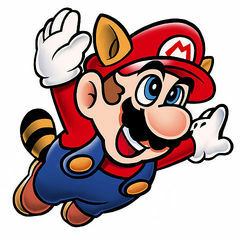 Given that in the classic Mario games all the way to Super Mario 64, flight was one of the key powerups, the return of the raccoon tail to the series is also a long time coming. But how do you make flight work in a 3D platformer? 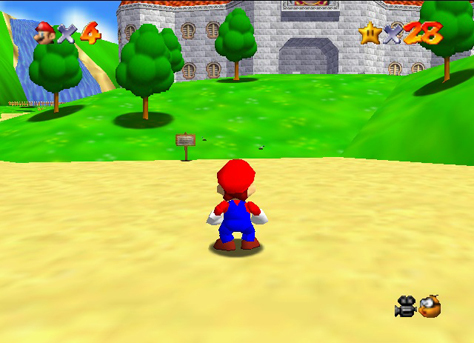 Super Mario 64 challenged you to fly to hard-to-reach coins in the sky or platforms surrounded by quicksand that you couldn’t reach otherwise, but then these challenges weren’t quite platforming per se, not in the same way that the courses of the 2D Mario games were. How can flight be used in a capacity that’s more comparable to its role in the classics? It’s hard to say, since honestly these kinds of powerups were never really “needed” except to reach some of the game’s most well-hidden secrets. I think the best way would be to severely limit its use. Even in Super Mario Bros. 3 you couldn’t fly forever (unless you had a magical P-wing) – so restricting the tail in Super Mario 3DS shouldn’t seem foreign or arbitrary. Assuming they stick with the “get to the Star to complete the course” formula of previous 3D Mario titles, they could use the tail as sort of a more dynamic way of getting between areas – whereas the Galaxy games just slung you ahead with a Launch Star, now you’d have to go airborne manually. In conjunction with some limits on flight distance or the duration you can maintain the powerup, they could design the course so that you have to get past some tough obstacles before you can reach a suitable takeoff point. Honestly, the more I think about it, the tougher it is to imagine how Nintendo might use flight mechanics effectively. Perhaps they’ll gimp the tail powerup a little bit so it only offers the ability to glide? Whatever happens, I know they wouldn’t try to put the raccoon tail in unless they had a good idea of how to put it to good use in gameplay, so I’m confident they’ll deliver. Even then, this is EAD Tokyo we’re talking about. If Super Mario 3D is anywhere near as fun as I found the Galaxy games, Nintendo should seriously give every staffperson in that department a massive bonus this holiday season. They’ll certainly be able to afford it.